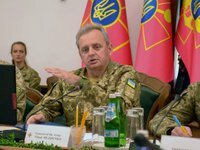 Ukraine will not give up the right of free navigation through the Kerch Strait, head of the General Staff of the Armed Forces of Ukraine Viktor Muzhenko has said. "Ukraine will not give up its right of free navigation," he told reporters in Kyiv on Wednesday, answering the question when Ukrainian ships will be able to pass through the Kerch Strait. In late February Ukraine's State Border Service Spokesman Oleh Slobodian said that Ukrainian ships currently do not cross the Kerch Strait, and foreign ships pass freely: "Vessels flying the Ukrainian flag, as a rule, practically do not pass through the Kerch Strait. As for foreign ships, now, under pressure from the international community, the Russian Federation lets them pass more freely, with fewer obstacles, to Ukrainian ports in the Sea of Azov." He said Russia this year detained and inspected 67 foreign ships moving to Ukrainian ports in the Sea of Azov.